"Nothing really inspires my fashion, I'm kind of retarded when it comes to it. So, I just go with what I initially like, impulse is key." 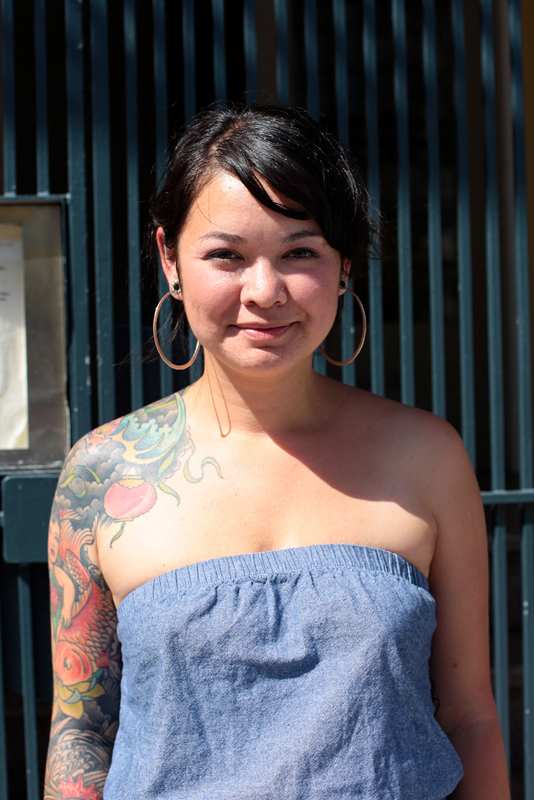 Maybe it won't surprise you that Lisa has been the proprietess of Haight-Ashbury Tattoo and Piercing since 2003. Despite her claims towards fashion ineptitude, I'm loving her one-piece chambray jummpsuit. I find anything denim/chambray to be on-trend these days. Also? Cute big gold hoops. A look at her Fun Steps (thanks Anon in comments!). those arent tom's! they're fun steps! the 6-dollar version of tom's which can be purchased in tan, white, black, and navy at your local rite-aid pharmacy. i love fun steps, a tried and true summer staple.